"41MR12, Burial III, 71" by Timothy K. Perttula and Robert Z. Selden Jr. 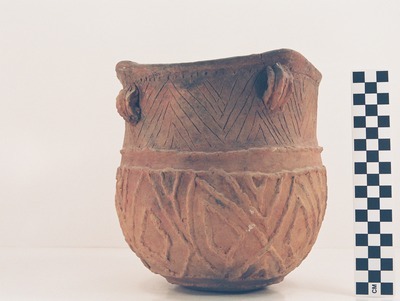 VESSEL FORM: Jar with a direct rim and a rounded, exterior folded lip. There are four peaks along the rim, and strap handles are attached just below the lip and directly under each of the rim peaks. DECORATION: The rim has an incised-punctated decoration. There is a single row of tool punctations under the lip, and eight sets of opposed incised lines, two sets between each strap handle. Each of the strap handles has vertical incised lines and vertical appliqued ridges on it. The jar body is covered with appliqued elements. This includes four horizontal appliqued ridges, two at the top and bottom, respectively of the jar body; the top two begin at the rim-body juncture. Between these horizontal appliqued strips are eight sets of appliqued diamonds in panels defined by intersecting diagonal appliqued strips. There are repeating triangular-shaped appliqued elements pendant from the second of the two horizontal appliqued strips at the top of the vessel body.